Hamida, 40, lives with her family in in Herat. She is illiterate. This is her story. Herat:— I don’t know the exact meanings of gender discrimination but I know I have seen a lot of it in my country and in my family. I am a mother and I want to support my daughters, but my husband is more powerful than me and at every opportunity he gives them more, whether money or freedom. In Afghanistan I can see day-by-day people are improving and have a more positive mindset compared with ten years ago. We can see those same dark-minded families let their daughters go to school. In some families we still witness problems, but we should be thankful of the ways the media is broadcasting people’s problems. Showing the gallows where those who do violence on women are hanged can have a positive impact on society. I have faced many problems in society like not being allowed to go out of my home and go to work to support my family. To stop violence, I start in my family and talk to my husband. Our brave young women who are allowed to go out to work can help other women. They can help illiterate women and raise our voice and bring awareness. 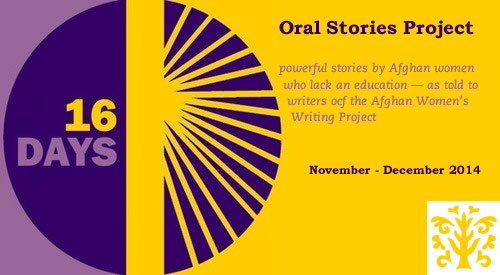 Hamida was interviewed by Leeda as part of AWWP’s Oral Story Project on Gender Violence 2014.